London’s Covent Garden shopping district is showcasing what it claims to be the largest showcase of augmented reality (AR) technology attempted in one location, with Christmas shoppers offered exclusive offers, gift guides and immersive shopping experiences. More than 140 stores and restaurants are participating in the project over the next six weeks in partnership with AR app provider Blippar. As well as being able to meet Santa in an interactive neighbourhood grotto and embark on an AR treasure hunt to catch reindeers hidden around the UK capital’s distinct retail district, shoppers will be able to unlock exclusive offers from an AR Christmas tree that can only be unlocked through the Blippar app — available on iOS and Android. An interactive AR map of Covent Garden with events and offers. Covent Garden says AR presents “ample opportunity for heightening consumer engagement and the technology is predicted to shift heavily toward commerce in the long term”. Earlier this month French department store Galeries Lafayette began using augmented reality to offer Christmas shoppers this year a virtual Arctic experience telling the story of climate change. 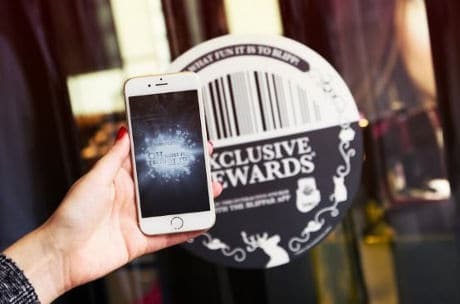 In 2015, hotel chain Residence Inn by Marriott piloted image recognition and AR that allowed guests to scan beverage coasters to access interactive experiences, including games and food and drink suggestions, on their smartphones.